George Graham Reviews Lyle Lovett's "It's Not Big It's Large"
Lyle Lovett occupies an interesting place in the crowded singer-songwriter genre. Lovett is very much a product of the Texas scene in the tradition of Townes Van Zandt, Guy Clark and Joe Ely, and his music first found an audience in the country world probably because of his use of a steel guitar, but his performance style is a distinctive and eclectic blend of country, folk, blues, African-American Gospel and big band jazz. His songs are often laced with whimsical lyrics, though he can also be melancholy when he wants to. In a recording career that has spanned over 20 years, Lovett has created a memorable body of work that is a kind of epitome of what we do stylistically here on Mixed Bag. Of course, Lovett had his fifteen minutes of fame in the commercial and tabloid media though his short marriage to actress Julia Roberts. Lovett himself has appeared a couple of films. But despite his brush with the tabloid world, Lovett has remained true to his musical vision, avoiding the obvious temptation to dilute the music for commercial purposes. Now, Lovett is out with his latest recording that is a kind of summary of his style, with all the above mentioned influences. 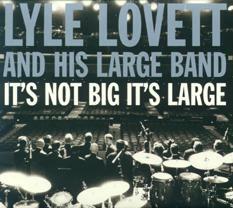 Once again he uses the appellation "Large Band" for his group, as in Lyle Lovett and his Large Band, and he calls his new CD "It's Not Big It's Large," perhaps as a retort to those who would confuse his group's name with that of the traditional name for jazz bands with a dozen or more members. And although there is a jazz big band track on the CD, literally playing an instrumental piece from the Big Band era, most of the material involves smaller ensembles almost of whose members are top-tier studio musicians from both Los Angeles and Nashville, and they include people with whom he has worked over the years including bassist Viktor Krauss, pianist Matt Rollings, drummer Russ Kunkel, guitarist Mitch Watkins, and fiddler Stuart Duncan. Although the performances are flawless, Lovett plows familiar ground in the material, and there's somewhat less of the clever offbeat humor that marks some of his best work. Instead, most of the songs seem like vehicles for showing off his band with various members being highlighted. But the CD is not without its share of Lovett-isms. Lyle Lovett his Large Band's new CD, It's Not Big It's Large is a typically fine recording by one of today's more eclectic and creative singer-songwriters. Although everything is first-rate musically on the CD, Lovett does little innovating, as he has done previously, instead concentrating on songs in his wide-ranging, but now familiar combination of styles. The songs here also have less of Lovett's well-known penchant for whimsical lyrics and clever juxtapositions. Now it's time for my weekly complaint about sound quality. Sonically, we'll give the CD a B-plus. Lovett's work has always a been well-recorded and mixed, and previous recordings have also had decent dynamic range. It's Not Big It's Large suffers, as do so many recordings these days, from excessive volume compression, squashing out most of the music's differences between loud and soft to make everything as loud as possible, which is totally inappropriate for this kind of music. The record industry's CD loudness wars apparently go on with no cease-fire in sight. It's Not Big It's Large is not his best or most innovative recording, but Lyle Lovett in a holding pattern is still greatly entertaining, an all-around fine listen, and head-and-shoulders above almost anything else on the mainstream pop and country music scenes.